I’m kinda thinking I love the name shower fries, so let’s continue to call them that. 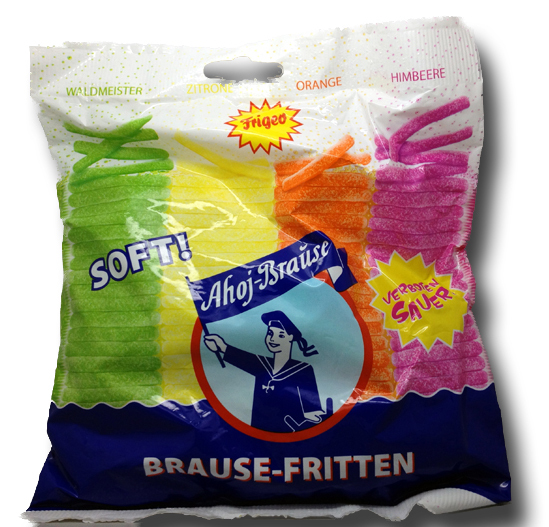 Frigeo is a German confectioner usually known for making dextrose-type candies in the tradition of sweetarts, etc. When I saw this bag come from The Suse, you have to know that I was salivating from the get go. Using the same template of flavors they tend to use, Frigeo stuck with lemon, orange, raspberry, and woodruff. Never have I seen another company use this flavor, but I’ve seen it several times from these guys. According to Wikipedia, the literal German translation of Woodruff is “wild baby’s breath; master of the woods”. Woodruff is an herbaceous plant that looks like it would hurt if you stepped on it. Of note, it’s also used as moth repellant. The actual flavor of woodruff, or at least this iteration of it, is a nosey, perfumed….sweetness. 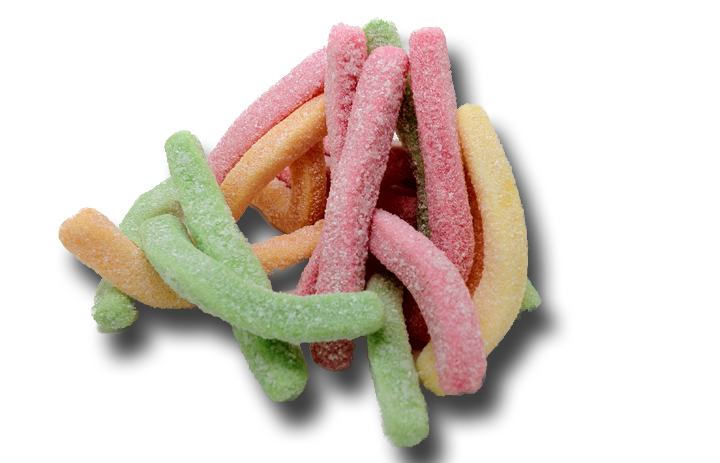 It’s not that memorable, and compared to other candies that Frigeo makes with this flavor, doesn’t quite represent the flavor so well. Regardless, it’s still yummy. I looked all over the web for someone describing the taste of Woodruff, but all I could find was a bunch of people struggling with it, Apparently there are very few foods flavored with real Woodruff, and this isn’t one of them. So…I guess it’ll stay a mystery. Overall, I wasn’t a huge fan of these. On paper, they’re dreamy, to be sure. But in execution, they just didn’t have the flavor I was looking for. 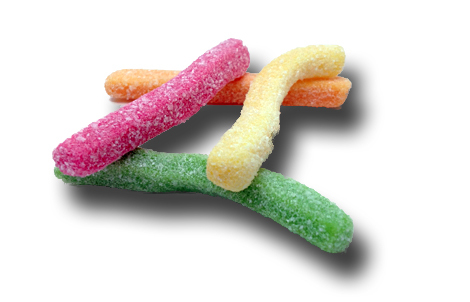 The “sour” billing is a bit of a red herring, as they really only have a slight tart coating that immediately gives way to a sweet yet mild flavored spongey gummie. Certainly not bad, but not what I thought they’d be. Overall, in the category of shower fries, one can do better. One german word for lemonade is the same as the word for shower “Brause”. Literally, it means something along the lines of “bubbling” or “splashing”.